PwC is an absolute behemoth – prestigious, mystical, and totally confusing to the outside observer. The firm has a 160+ year legacy, and a brand that is cobbled together from so many pasts that it’s hard to tell which way the firm is headed. Here’s what we know – PwC is a survivor. In the midst of the globalization of audit, growing cross-border complexity, international regulatory shakeups and threats to the core business, PwC has consistently returned to its core. With each challenge, the firm grows stronger. Now, the firm is at the top of its game – and has big plans in the consulting space. Whether you’re planning to interview at PwC or just want the lay of the land, check out one of the coolest business stories consulting has to offer. PwC has a long and rich history. Did we explain how long? That’s right – 160+ years long. However, this isn’t unusual for its heritage – founded in England, longevity is a common trait for many companies in the U.K. business world. PwC was basically created by a merger between 2 firms – Price Waterhouse and Coopers & Lybrand. Below is a timeline of key milestones for both companies until they merged in 1998. 1849 – Samuel Lowell Price starts business in London. 1854 – William Cooper founds his own practice in London. 7 years later it becomes Cooper Brothers. 1865 – Price, Holyland and Waterhouse join in a partnership. 1874 – Business name changes to Price, Waterhouse & Co.
1898 – Robert H. Montgomery, William M. Lybrand, Adam A. Ross, Jr., and his brother T. Edward Ross form Lybrand, Ross Brothers and Montgomery. 1957 – Coopers Brothers & Co. (UK), McDonald, Currie and Co (Canada) and Lybrand, Ross bros & Montgomery (US) merge forming Coopers & Lybrand. 1982 – Price Waterhouse World Firm formed. 1990 – Coopers & Lybrand merges with Deloitte Haskins & Sells in multiple countries. 1998 – Worldwide merger of Price Waterhouse and Coopers & Lybrand to create PwC. Following the merger, PwC had a massive consulting branch that was responsible for much of its revenues. This part of their business was called “Management Consulting Services” or “MCS”. MCS was incredibly profitable in the 90s due to its global implementation of Enterprise Resource Planning systems, also known as “ERP”. Most of you probably are clued in, but some of you Millenials were just toddlers, so here’s some background on the advent of an industry. An ERP system is an enterprise business management software program that organizes and tracks large company’s resources (cash, raw materials, production capacity, etc.) and status of financial commitments – commitments like sales orders, purchase orders, payroll, inventory, shipping, and taxes. Multiple departments input data and the ERP system stores arrange and produce analysis on any of the data required for applicable analysis. It helps facilitate error-free transactions and production (before ERP, people actually used odd things like pens, paper, and ledgers to keep track of their stuff). ERP software was originally created as a cure for the Y2K problem, also called the Millennium Bug, which affected both the digital and non-digital documentation and data storage systems – the anticipation of Y2K drove the ERP boom in the 90s. PwC’s incredible growth in the 90s drew media and regulatory attention because clients had the same company auditing and selling financial software management solutions – albeit through different branches of the firm, the collaboration between practices was very high and PwC staff from both functions were on-site together. This was clearly a conflict of interest. In fact, many other major auditing companies had consulting arms offering similar services, and all the majors began to be questioned just as rigorously. PwC is a legacy king of regulatory mastery – that’s what years of audit expertise will do for you! Something had to be done, and quickly. In 1999-2000, PwC decided to have MCS disengage with current audit clients and not sell financial systems design and implementation services. It was a great solution to the one problem, but it created another – PwC’s most attractive audit clients were also the most attractive ERP clients. The intentions were good, and MCS lost dramatic revenue overnight, but a formal wall between the 2 service sectors wasn’t created. Then came the financial auditing scandals of Enron, Worldcom and others, leading to the passage of the Sarbanes-Oxley Act. Hewlett-Packard was in negotiations to purchase MCS for $17B prior to the scandal’s blast on the industry, but negotiations predictably broke down in 2000. SOX severely limited even more the interaction between management consulting and financial auditing services. In response, the MCS division of PwC re-branded as PwC Consulting. In May 2002, PwC announced PwC Consulting would branch off to be its own independent entity and would have their own CEO to run the global firm. Interestingly enough, in October of this same year, PwC changed their mind and sold their entire consultancy entity to IBM for the low-low price of $3.9B in cash and stock. IBM GBS absorbed PwC Consulting and doubled in size. 2009 began another era of change and purchasing frenzy as PwC decided to re-create a consultancy branch, starting with the acquisition of Paragon Consulting Group and the commercial services business of BearingPoint. In 2010, PwC continued the trend by buying out Diamond Management and Technology Consultants, Inc., and in August 2011, purchased PRTM. PwC moved on to acquire Ant’s Eye View, in August 2012, a social media strategy development and consulting firm. In 2013, PwC decided to partner with Pneuron Corporation, an enterprise data integration firm. This was to strengthen data management capabilities and solutions specifically to help large firms manage massive amounts of data. The most recent acquisition and the most interesting to us was announced on October 30, 2013 – PwC made public its intention to acquire Booz & Company. The deal was completed in April 2014 with the renaming of Booz & Co. to Strategy& following shortly afterward. Today, the main clients of PwC are in Europe and North America – the 2 regions account for 81% of PwC’s annual revenue. Europe alone accounts for 45%. PwC’s audit sector includes 40% of companies in the FTSE 100 Index and 45% of the Fortune 1000 energy companies. Overall, PwC’s revenue auditing accounts for over 50%, but growth is expected to come primarily from the consulting practice – hence the continued focus on acquisitions in the fast-growing services sector. PwC is recognized as one of the “Big 4” accountancy firms and the world’s largest professional services firm by revenue. While PwC is a global brand in the professional services industry, each member firm in various locations around the world is locally owned and operated and subject to the laws of their geographic jurisdictions (which makes sense, because some countries require this of accounting firms). Global member firms are a part of the PwC network and share common core values set in place by PricewaterhouseCoopers International Limited (PwCIL), headquartered out of the U.K. In contrast to many unregulated consulting firms (strategy firms top this list), members of the PwC network are not allowed to operate as a global partnership, which includes being identified as a single multinational corporation. The PwCIL simply acts as a coordinating entity and umbrella for member firms in its network and does not offer accountancy or any other services to clients. The member firms’ senior partners sit on a global board of partners. Work with companies as they pursue new opportunities, deal with serious events, and manage the daily pressures of growth, competition and shareholder value. This is the area where consulting lives, and the primary focus of this article. Help clients with complex financial accounting and reporting issues such as capital markets transactions, IFRS conversions, and Sarbanes-Oxley compliance. Assists clients with critical tax issues by providing quality tax services and in-depth knowledge of the industries and markets in which clients operate. Helps federal agencies solve complex business issues, manage risk, and improve financial measures and the overall quality, efficiency and effectiveness of public service. Keep PwC running, providing strategic and creative services to internal clients. IFS departments include: Human Capital, HR Shared Services, Learning & Education, Knowledge Management, Technology Solutions, Finance, Marketing, Facilities Planning and Office Operations, and Risk Management. If an industry is big, it’s on PwC’s list. The firm owns a significant share of the global advisory market, so if you are interested in breaking into a specific practice make sure you go directly to an office or expert of interest. Globally, PwC has only 3 peers in terms of its brand – Deloitte, E&Y and KPMG all have similar histories, structures, strong auditing practices, and growing consulting arms. However, PwC does compete in areas of particular strength (think healthcare, oil & gas, etc.) with MBB, and with a whole slew of smaller firms on the operational consulting or audit side of the business (mostly serving divisions inside firms, not C-suite leaders). Because for what other firm could you work as a consultant in Uzbekistan? Since each member firm governs its own approach to a career path, and both interns and employees have different experiences in their respective locations. To offer a strong representative sample, only the U.S. member firm’s career path will be highlighted here (but in strong European markets, for example, expect a very similar parallel path). 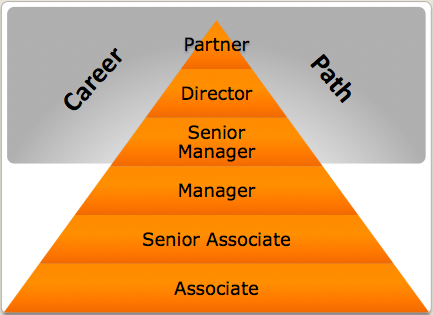 Below is an illustration of a summary of positions at PwC. There are sub-levels like Managing Director, Sr. Director, Sr. Partner, etc. that are not reflected here. Most undergrads start as Associates unless you are an experienced hire, and MBA hires start as Senior Associates. Don’t expect promotions to come quickly or easily – and here is one of the major disadvantages of starting with PwC – most employees say to expect a couple of years before promotions or even pay raises. Compared to the rapid escalation at MBB, the math doesn’t pencil out after the first year or 2 – even if the starting pay is close. PwC’s internship program in the U.S. is called “Advance”. Most who acquire internships do so by applying through career fairs at their campuses. PwC pre-arranges and invites students to a pre-night social dinner interview. Be warned – they won’t tell you, but this is truly your first round interview! They are taking notes and deciding whether to invite you to interview further. Because the fit assessment is huge for PwC, making a strong interpersonal impression at social events and networking sessions is critical. On average, there are 4 rounds of interviews, including the dinner – the process seems to take on average 4 weeks. If you pass the PwC case interviews in the 1st round, you’ve done the hardest part – after the first round, PwC switches to sales mode. The majority of questions in following rounds are more behavioral in nature – interviewers are really trying to figure out whether or not your personality fits their company. Even for consultants, it is important that you do some outside research to ensure you can speak to not only current business issues, but also to relevant accounting issues when asked. Definitely, make sure you have read about the company and understand your own reasons for wanting to intern there. Why do you want to intern at PwC? What did you do to encourage someone to cooperate with you? Here are the 7 things PwC says you can look forward to in your internship with them. You will have specifically designated training to increase your technical skills, both at the beginning of your tenure and throughout. The projects you will be assigned to are real-life client scenarios and will increase in difficulty as you complete each assignment. You will be on a team focused on real company assignments and needs, but many of the training programs will not be real-time (PwC will have worked for the client in the past, for example). However, PwC does consider all experience a training ground – this may mean you are thrown into a project and are faced with tasks you are unsure of how to do even before completing the firm’s extensive global training program. Additional instruction outside of their corporate training classroom is entirely for you to seek out. Compared to a comparable firm (we’ll pick IBM GBS), expect PwC to offer more technical training on how to do analysis and research vs. strategic training on solving business problems. A team of seasoned employees will be assigned to you to mentor, train, and supervise you throughout your time at the firm. You will be working directly with PwC partners, principals, and staff. Make sure you utilize your time wisely and develop a sincere relationship with them – after all, even in a business full of numbers and calculations, it’s all about relationship and trust in the end. When not on the clock, it’s time for fun. Time to network and socialize outside of your team and responsibilities are provided by PwC (as in, they arrange them and they pay for them too!). The firm believes that relationship building will be a key to your success, and PwC people are generally likable and social. There are some very interesting optional pieces to the PwC internships as well. For one, a sub-set of interns will be selected to participate in PwC’s “shadow experience”. This is an opportunity for those selected to shadow members of PwC’s U.S. leadership team. This includes Bob Moritz, chairman and senior partner of the U.S. firm. In addition, PwC shows commitment to people, communities, and environment by having a select number of interns assigned to a project specifically designed to improve an environment, education system/opportunity or other social issues. The location can be domestic or international. Finally, PwC U.S. selects a few interns to intern outside of the U.S. for a 1-week assignment. The interns are sent to various locations within their global network of firms. An intern is paired with a current U.S. assignee abroad to experience that lifestyle and office culture. PwC is a great place to start a career, and the golden handcuffs do get pretty sweet for the senior folks – although pay is much more stagnant and caps out way, way below MBB firms. However, recognize that because of the giant global brand with little cohesion, the exit opportunities are going to be much more in line with what you actually did at PwC vs. the fact that you worked there – so make sure that if you’re planning to leave (and you should start with that strategy), you are highly strategic about which office you select and which projects you angle for when on the job. The good news? Leaving PwC will likely result in a pay raise – other firms value the training and experience the firm offers to early-careerists. Other firms (Deloitte, IBM GBS) are better known for their professional training, compensation and work/life balance, but PwC has a great scorecard on diversity. The firm has received an extensive laundry list of diversity focused awards, and are widely known as a company who is best in class at offering great flexibility programs and support for working mothers and parents who are adopting children. They take great pride in their corporate social responsibility worldwide. There are many opportunities for exposure and training from senior leadership and working on assignments from top companies around the world. You have options to transfer to global member firms within the greater PwC network. When you’re building your own brand, the PwC brand is prestigious to have on your resume. Current employees recommend that you consider moving on to another corporation by about the 5th year unless your goal is to become a partner – it’s a long road to the top. So where could PwC improve? One key issue is work/life balance. You should take responsibility to manage and proactively plan your approach to work/life balance in any industry, but in PwC consulting culture, it seems to be more of a constant tension and challenge especially during peak seasons (which differ depending on your assignment and field) – expect some nasty 7-day week stints. At PwC, you should expect to be on the client site more than you would with Deloitte S&O or Bain, for example – 5 days a week on the road are not an anomaly, although 4 are the norm. Applying for a job at PwC comes in many forms. It can be by current employee referral, online application, recruiting, or through your college. 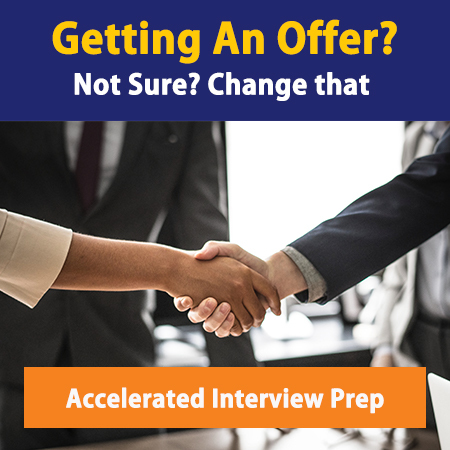 After your application has been submitted and reviewed, an HR staffer does an initial screening over the phone before deciding whether you are worthy for additional rounds of interviews – this process is standard at Big 4 firms, but not at strategy houses. Recognize and prepare for the importance of this call – it’s not just a formality! If you are selected, you will be scheduled for what is commonly known as the “superday”. Prepare yourself for up to 3 rounds of interviews within the same day – each with one person. The first round might be with a Manager; second, a Director; third, a Senior Partner. Questions will range from technical to behavioral, depending on your position and the practice you are applying for. PwC case interviews are similar to the style profiled in Case in Point – they are loosely organized, focus on a simple question, and highlight your ability to focus on key issues, solve basic math and collaborate. They are not as complicated as McKinsey cases, and not as quantitative as cases for firms such as Accenture or Deloitte. Don’t expect major case interview tricks – but do be prepared to have a fast-paced business conversation. Be prepared to answer business case questions, regardless of the position you are applying for – and don’t answer them McKinsey-style. Being too thorough (in the name of structure) or strong-willed in a PwC interview is a death sentence because collaboration is so highly valued. The entire process can average up to 3 weeks. However, if you apply through university, expect lead times anywhere from 3 weeks to 3 months before all is said and done. Can you give me an example of an experience in your career where your client/somebody else asked you to do something unethical? How did you handle that? How would you support a team of 30 individuals who were not co-located and were constantly on the move? Are you an undergrad, MBA or intern who’s interested in working at PwC, but you don’t know how much you’ll make? Check out our latest Management Consulting Salaries post to find out! It’s important to recognize that PwC recruits on a LOT of campuses around the globe, but not all campuses are targets for consulting. However, coming from one of these schools is important for consulting – it’s easier (and possible) to break into a different practice from a target school, and nearly impossible to break in if you aren’t from the list of schools below. Another keynote here – don’t take the easy road and jump into audit if you’re thinking of aspirations in consulting later. It’s nearly impossible to switch, and the firms really do handle hiring and onboarding in a parallel but entirely separate way and the wall between practices is nearly unscalable. Talent has no age, race or gender and can’t be ruled out because of a disability. Open-minded means one can adjust to different types of working styles. U.K. member firms created and implemented “Open Mind”, a U.K. member-wide training program using e-learning, video and face-to-face discussion sessions to help member firms reflect on how open-minded they are. PwC is currently launching a network-wide program. Global Mobility Program increases the delivery of high-quality services to clients while developing cultural skills and international awareness of people across the PwC member network. Genesis Park is a leadership development program focusing on expanding creativity, problem-solving skills, and cross-cultural understanding through real work/life experiences and real-time coaching. We’re creating better workplaces for people. PwC has agreed to uphold the United Nations Global Compact (UNGC) on human rights, labor, environment, and anti-corruption. Many PwC members offer support for people’s own charity or community activities through programs such as ‘matched giving’.